The second in the Wagers of Sin series. The first book is My Once and Future Duke, wherein Eliza's friend Sophie meets her duke. Eliza's father calls her Lilibeth, as a nickname for Elizabeth. I was inspired by Queen Elizabeth II's childhood name, Lilibet. Don't miss my Pinterest board for this book, with photos of gowns and tickets and dogs like Willy. Bonus! There's a bonus story for this book, between The End and The Epilogue. How much did Eliza's father suffer for what he did? Read it here. If Hugh Deveraux’s father had taught him anything, it was how to keep up a good face even when everything was going wrong. Unfortunately Hugh did not realize this until his father was dead, and he discovered how very, very wrong things had gone. It certainly shouldn’t have been that way. Joshua Deveraux, sixth Earl of Hastings, seemed blessed from birth in every way. No adversity could shake his good humor or dull his ready wit, and as a result he was adored, even marveled at, by his somber, serious family. He grew into a legendary bon vivant, a striking contrast to his reserved father and grandfather. He had a way with people that won him praise and admiration from his peers and subordinates alike. Where his ancestors had viewed it as a sacred duty to marry an heiress and build the family fortunes, Joshua was indulged and allowed to wed the girl he loved, who had great beauty and charm but a small dowry. He even inherited his title and considerable estate while still young and very handsome, and was henceforth regarded as possibly the most fortunate man in Britain. Hugh certainly grew up thinking so. Unlike other sons, he was raised at his father’s knee, and there was no one he admired more. His mother was kind and loving, too, but his father was even more—clever, boisterous, energetic, and never angry. When Hugh got into scrapes and mishaps as a lad, his mother would reproach him with tears, but his father would thump him on the back and take him for a thrilling ride across the countryside. No sense moping about what’s done, he’d say; chin up and face forward. It was only when his father died that Hugh realized his father’s good nature had concealed a few intractable flaws. Joshua had loved his wife and children deeply, but he’d never imposed the slightest economy or restraint on them. He raised his son to be master of a great estate, as he himself had been raised, but he never made Hugh privy to the books and accounts of that estate. And while everyone knew—in an indulgent, admiring sort of way—that the earl was far from miserly, no one suspected the truth until his death at the age of fifty-eight. Bilious indigestion, declared the doctor over the deathbed. Guilt, thought Hugh grimly, two days later. Joshua, it turned out, had been unlike his careful, dutiful father and grandfather in nearly every way. Instead of building the family wealth, he had spent it—all of it. Nothing had been put aside for his daughters’ dowries, and his wife’s jointure was pathetically small. And not only had he omitted the most elementary steps to preserving his wealth, Joshua had been generous to every wastrel friend in need, spent prodigiously on art and horses and houses, wagered and lost extravagantly, and generally frittered away one of the largest fortunes in Britain. And no one had had any idea. “The good news, my lord, is that the mortgages are quite reasonable,” added the attorney, in what could only be called poor consolation. “Which means I cannot sell anything,” Hugh said softly. The attorney blanched, but didn’t argue. Hugh seethed as the man bowed out of the room. Sawyer must have known, for several years, that the late earl was spending far more than he could afford. Obviously he hadn’t stopped it, but neither had he ever whispered a word of warning in Hugh’s ear. A thought struck him. Did his mother know? The countess was in deep mourning, her eyes still red from weeping every day. Hugh thought of his parents together, of his father laughing and teasing his mother, and realized this was the last thing he would have told her. 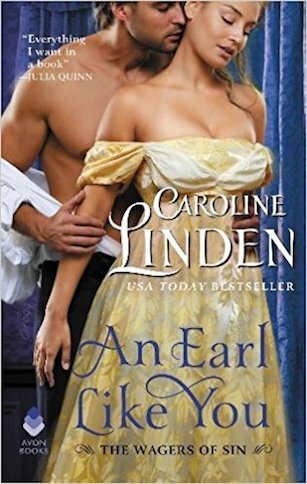 However feckless he had been, the late earl had adored his wife and wouldn’t have wanted to alarm her. Which meant Hugh would have that happy task. His shoulders slumped at the prospect. First she had lost the love of her life, and now he was about to take away her security and possibly her home. Because there was no way he could maintain all the Hastings properties on the funds he had left. The income from them couldn’t come close; not only had his father been spending capital for years, he had done very little to make his lands productive. His estate lands were covered with acres of graceful lawns and perfectly maintained thickets, with ponds and temples and follies. Not farms or mines or anything that produced income. When Hugh had asked about that, wondering why other estates were more constricted, Joshua had laughed. “Who wants to ride around fields of wheat? All those farms are so damned ugly. So many fields one may not ride across.” Like an idiot, Hugh had accepted this answer and even felt appreciation for it the next time he took a rousing ride through those wide-open fields and woods. Obviously all that would have to change, but it would take time and capital, two things he was suddenly quite short of. He exhaled. “Yes, he’s gone.” And may the devil take him. “I know.” Hugh put his arm around his sister and kissed the top of her head. Edith was beautiful and petite, like their mother, and far too young to be burdened with this. His father had protected his wife and daughters from every unpleasantness, and in that much, Hugh wanted to emulate his father, at least for a while. Of course, if his father hadn’t died, what would they have done? Hugh closed his eyes as the answer became apparent. The estate would have been mortgaged even more heavily and bled to the bone. Another five or ten years and Hugh might have inherited a far more desperate circumstance than he faced now—and with every likelihood that he wouldn’t have had any more warning. Rosemere was the estate in Cornwall. It was quiet and beautifully idyllic, and it would be a wonderful place for the countess to recover from her heartache. It had been his father’s favorite home, the one he had rebuilt—at tremendous expense—and renamed for his mother, a token of his great love for her. If his mother could be happy anywhere, it would be at Rosemere. But it cost the earth to maintain all these houses. Sawyer had laid out the estate accounts in grim detail, and the expenses were crippling. Hugh realized the best thing to do was put the grandest properties into Holland covers until he could find tenants for them, and retreat to the most economical home. Ironically, and unfortunately, that was the London house. His father hadn’t liked London, so the Hastings house near St. James’s Square was comparatively modest. It had been leased the last few years, but was empty at the moment. It would be dreadful to go to London in mourning, but his sisters were almost old enough for their debuts—assuming he could afford to launch them properly. If Edith and Henrietta could make decent marriages, at least they would be settled and secure. It would be vital to conceal all hints of poverty, of course, further proof that he couldn’t tell his family how badly off they were. There were even more reasons London was ideal. Hugh had been raised as a gentleman, with no profession or even much education of anything practical. But he was good at one thing, something his father had approved of as very aristocratic, something he could do without attracting any notice. London teemed with gaming establishments and gambling men. If he cut his expenses as much as possible and enjoyed modest luck at the tables, he could keep them afloat until he contracted marriage to an heiress. Elizabeth Cross had grown up as the lady of the house. Her mother died when she was three, giving birth to the baby brother Eliza had begged for. A week after Susannah Cross died, so did that tiny boy, whom Eliza had called Flopsy. When she was older she learned his proper name had been Frederick, after her grandfather, but at the time she cried for Flopsy and for Mama, and gave her second favorite toy to be buried with them. And from then on, it was just Eliza and Papa. Her papa was a very busy man, but Eliza was the center of his world. He wanted her to have the best of everything and was determined that she would grow up knowing important things, things her mother would have taught her. “You should be a real lady, like your mother,” he would insist, even though Mrs. Cross had only been a baronet’s daughter and therefore not a born lady. As a child Eliza constantly worried that she was falling short, but when she would anxiously inquire if she were becoming more like a lady, Papa would reply that she was doing splendidly, and he must do better to find someone who could teach her what she needed to know. Eliza tried her best to learn, first from her governess, then from her teachers at Mrs. Upton’s Academy for Young Ladies, then from the companion hired to help launch her into society. By the time she was nineteen, she was confident that she could hold her own with any duchess when it came to serving tea, arranging flowers or planning a menu, or choosing the most stylish gown. But she was equally as confident that she would always be considered a nouveau riche upstart by the London society her father was so determined to impress. Edward Cross had made his considerable fortune speculating in shares of hemp and iron and lead, all desperately needed by the British Navy during the wars. No matter how elegantly she dressed or how superbly she danced, nothing would ever erase that fact that her dowry was due to trade. She was an heiress—and quite a rich one at that—but not remotely a lady. To draw a horde of aristocratic suitors, the sort who could elevate her to the social status her father craved, a girl needed three things: beauty, connections, and money. Eliza knew she was no beauty, and she had no noble connections. And really, she thought that if she could only have one of those three things, money was certainly the best. Even if she never married or attended a single society ball, she would still have a safe home, enough to eat, and means to provide for her dog. The dog was more important to her than the home and food. Willy was a puppy when she found him walking home from the village. He’d been just a tiny ball of straggly black and white fur, hiding under a forsythia bush, but he crept right out when Eliza went down on her knees and reached out her hand. He arched into her hand as she petted his head, and her heart melted into a little puddle of love. She carried him home in her arms, considering all manner of grand names for him. Papa was not especially pleased to see the puppy. “A mutt,” he said when Eliza showed him. “He’s a baby,” she said. “And so sweet.” The little tail thumped against her side like a heartbeat. He snuggled in the crook of her arms as if he were home. Eliza kissed his head and smiled. “No one will. He was waiting for me.” Without waiting for his answer, she walked out and by the time dinner was served, the puppy had been washed, fed, and provided with a plush sleeping basket in Eliza’s own room. There were disadvantages to being an only child, responsible for the household, but there were also distinct advantages, namely that Eliza tended to get whatever she wanted. No one said a word about getting rid of Willy from then on. And Eliza found herself very content with her life. Papa was a restless sort, always out and about either on business or manly pursuits. He was still a relatively young man, very fit and hale, and Eliza suspected he kept a mistress, a widowed lady who lived in Portland Place in London. But that left her free to do as she pleased. Every fortnight she went into London to shop and take tea with her two dearest friends, Lady Georgiana Lucas and Sophie Campbell, whom she’d known since they met as girls at Mrs. Upton’s Academy. She took long walks with Willy and visited the lending library in Greenwich. She helped out at the church, visiting the parishioners with the vicar’s wife who was also her friend, and she could spend many happy hours pottering about her garden. The only sore spot was that fact that she remained unmarried, without a suitor in sight. While Eliza was coming to accept, deep down, that she would end up as one of those rich old ladies with a pack of dogs—she hoped to be quite an eccentric—her father was not nearly so sanguine about the prospect. “I thought lap dogs were something only married ladies had,” said Papa at breakfast. He grunted, but let the subject drop. Willy, energized by the bacon, jumped up and began sniffing around the floor under the breakfast table. “I thought we agreed the little beast would stay in the garden,” said Papa. “It’s raining.” But Eliza pointed at the basket in the corner. Willy’s ears sank, and he gave her a tragically sad look. Eliza kept pointing and finally Willy heaved a sigh and trotted to his basket. He settled his head on the edge and continued to watch her with alert brown eyes. “Dogs don’t mind a trifling spot of rain. He’d go right out if I tossed a bit of kidney out the door.” Papa speared a piece on his fork and cocked his head. Willy’s ears went up. “I’m not teasing. I’d really throw it.” Papa ate the kidney and put down his fork. “Good news on both counts,” said Papa with pleasure. “Mrs. Reeve is a very kind lady.’” Eliza noticed her father’s cup was almost empty, and she poured more coffee for him, adding a drop of cream, as he liked it. “If you would simply make a donation to the church, Mr. Reeve would cease asking.” Mr. Reeve was the vicar, and not as gentle-mannered as his wife. “Don’t lose too much,” she returned. She knew Sir David Southbridge and Robert Grenville were not only business partners of Papa’s but gambling mates as well. They never wagered against each other but all three were ruthless competitors, in business and at cards. When Papa arrived home after late nights with them, usually much the worse for drink, he’d tell her stories about Grenville wagering thousands of pounds at the tables, or Southbridge’s steely nerve in risking shares of his trading company on a horse. A smile tugged at his lips. “That’s not what I meant.” She wrinkled her nose and finally he laughed. “I love you, Lilibeth,” he said, calling her by her childhood nickname as he dropped a kiss on the top of her head. “I love you too, Papa, even though you long to be rid of me.” But she said it with a fond smile. She rolled her eyes again. He was in rare form this morning. Eliza took a bite of her muffin. She thought that mythical man would have to look very closely at her to determine that, and none of the titled gentlemen she met looked twice at her. Nor did any of the common gentlemen. If she let herself dwell on it, it would be quite lowering, really; even with a large dowry, an elegant wardrobe, and every accomplishment a lady could have, Eliza rarely warranted more than a passing glance from gentlemen of any standing. She knew she was plain and quiet, but she’d seen Lady Sarah Willingham, daughter of the Duke of Jarros, attract a few suitors despite being shy and having a squint. “Perhaps someone will, some day,” she said, choosing to placate her father. But Eliza saw the shilling-sized piece of bacon he stole from the platter and flicked at her dog. Willy caught it in mid-air and swallowed it in one bite. His tail wagging, he barked in thanks. Papa was already out the door, shrugging into his coat as he strode down the corridor without a backward glance. Willy yipped in happy agreement. “Yes, miss.” The footman stepped forward and snapped his fingers at Willy, whose ears drooped as he realized Eliza wasn’t coming. She made a shooing motion, and the dog followed James. She wondered when Papa would accept that she wasn’t the sort of girl gentlemen flocked to. In his eyes she was lovely, but Eliza knew he was the only one who saw her that way. Plain girls had made splashes in society, but usually by virtue of being vivacious and witty. Eliza tended to grow mute and hesitant in the presence of elegant strangers, and any wit she had vanished from her brain. Undoubtedly Papa hoped her enormous dowry would outweigh her shyness, but Eliza would rather be that eccentric old lady with a house full of dogs than marry a husband who only wanted her money. So Papa could dream, but Eliza was far less certain. Perhaps some day she would meet an affable country squire who didn’t need a beautiful, charming wife, but preferred a quiet girl content to play with her dog and tend her garden. And if not, she would just remain as she was.